When you’re out and about with your precious little one, you need to make sure you have diapers, bottles, clothing and more. Securely attaching to almost any stroller handle, the Monster Tots Stroller Bag provides convenient storage space for all your essentials while taking long strolls or running errands around town. Built to last, the bag is expertly crafted with a waterproof, 420D polyester exterior combined with a 210D polyester interior. It also features strong mesh for breathability and 3mm foam padding to keep your belongings protected. As such, it will see you through all of your outings. Two insulated beverage holders are ideal for keeping baby bottles cold and close at hand when feeding time approaches. 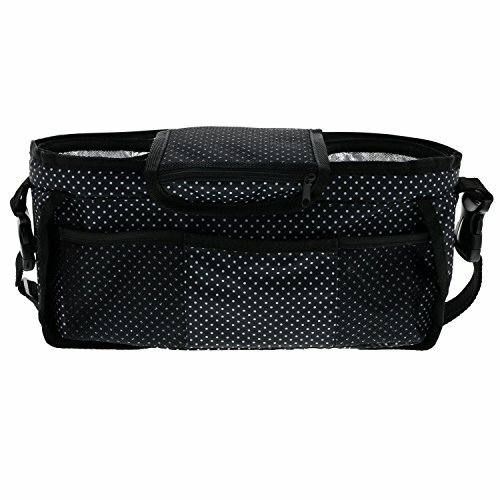 The large center compartment with Velcro closure is ideal for storing snacks, diapers and other items, while a small zippered pocket on top is perfect for securing cash, keys or ID. Additionally, two cell phone pockets in front provide quick access to your phone to make and receive important calls. If you have a baby shower to attend or someone important in your life has just welcomed a new member into the family, this Stroller Bag will make a great gift. This practical accessory will make any parent’s life easier and more organized, making it perfect for new and expectant mothers alike. And since it’s furnished in black, dads won’t mind sporting this bag around town either. Stop digging around at the bottom of your diaper bag and store your essentials in neatly organized compartments instead. When your little one is crying, quick retrieval is key to your baby’s happiness and your peace of mind! HIGH-QUALITY CONSTRUCTION. Made using a waterproof, 420D polyester exterior combined with a 210D polyester interior, the Monster Tots Stroller Bag will see you through all of your outings with the little one. EASY ORGANIZATION. Multiple pockets provides convenient storage for all essentials when your strolling with the baby. You can keep items neatly stored in designated pockets, allowing easy access for retrieval when needed. GREAT GIFT IDEA. Perfect for new and expectant mothers alike, this stroller bag will make a great gift for baby showers or when visiting the new parents in the hospital after the baby is born. It's a practical gift that will make any mom or dad's life easier and more organized. If you have any questions about this product by MONSTER TOTS, contact us by completing and submitting the form below. If you are looking for a specif part number, please include it with your message.